Midrash (מדרש; plural midrashim) is a Hebrew word referring to the exposition, or exegesis, of a biblical text. The term can also refer to a specific compilation of midrashic teachings. The two basic types of midrash are known as Midrash Aggadah, regarding the ethical or spiritual exposition of a text, and Midrash Halakhah, referring to the exegesis of biblically-related Jewish law. Jewish tradition allows a broad range of midrashic opinion, and interpretation from an aggadic point involves a greater freedom of speculation than expositions aimed at determining of legal maxims. Midrashic material is now known to have been set to writing as early as the first century B.C.E., having been discovered among the Dead Sea Scrolls. However, written collections of rabbinical midrash first began to emerge in the late second century C.E. Since then, a vast corpus of midrash has been preserved, covering virtually every subject, from the creation of the world to the coming of the Messiah. In midrashic tradition, many different exegetical methods are employed to derive deeper meaning from a text. Traditionally, 13 textual tools are attributed to the early sage Rabbi Ishmael, which are used in the interpretation of Halakha (Jewish law). However, aggadic (non-legal) midrash is not limited to these. Indeed, a wide range of speculation and interpretive freedom is evident in the midrashic tradition. In many cases, a midrashic passage is expanded manifold: Handfuls of lines in the biblical narrative may become long philosophical discussions, with the opinions of various rabbis juxtaposed to one another. Midrashic tradition sometimes presents these opinions as actual dialogs that took place in early rabbinical academies or courts, but many such "discussions" are clearly the creation of later redactors. Some midrashic passages contain fantastic legends about previous rabbis or biblical figures. Some passages reach the heights of mystical ecstasy and theological speculation, while others concern the minutiae of everyday life, fine legal distinctions, and arguments about the proper interpretation of various certain biblical statements. Beyond the basic division of halakhic and aggadic forms, midrashic tradition may be further divided into four interpretive categories: Peshat (simple meaning), remez (hints, clues), derash (interpretation), and sod (mystical or "secret"). Rabbi Akiva said: "'You shall love your neighbor as yourself.' This is a great principle of the Torah." Ben Azzai disagreed: "The verse 'This is the book of the descendants of Adam… the human whom God made in God's likeness' (Genesis 5:1) utters a principle even greater" (Jerusalem Talmud, Nedarim 9:4, 41c). Both halakhic and aggadic midrashim were at first preserved only orally. The written compilation of rabbinical midrashic tradition commenced in the second century C.E. Halakhic midrashim were first collected in the Mishnah, traditionally ascribed to Rabbi Judah haNasi in the late second century. Here, biblical verses function as a proof-text of a law's authenticity. However, many such rabbinical laws have no direct biblical source, but are believed to be part of the Oral Law revealed to Moses at Sinai simultaneously with the written Torah. The Mishnah itself does not generally cite a scriptural basis for its laws, but bases them on the opinions or the early rabbinical sages known as the Tannaim. However, later rabbinical tradition in the Talmud and other halakhic texts often connects Mishnaic law with the scriptures through the tradition of midrash. The non-legal midrashim are also referred to as aggadah or haggadah, a loosely-defined term describing any non-halakhic discourse in classical rabbinic literature. Aggadic exegesis involves a much greater freedom of exposition than its legal counterpart, often including highly speculative and legendary material. All kinds of biblical subjects are covered in aggadic midrash, such as the lives of the patriarchs and matriarchs, angels, demons, paradise, hell, the Messiah, Satan, feasts and fasts, parables, legends, miracles, and satirical assaults on those who practiced idolatry. "And God saw all that He had made, and found it very good. And there was evening, and there was morning, the sixth day." (Genesis 1:31)—Rabbi Nahman said in Rabbi Samuel's name: "'Behold, it was good' refers to the inclination to good; and 'Behold, it was very good' refers to the inclination to evil. Can then the inclination to evil be 'very good?' That would be extraordinary! But without the inclination to evil, no man would build a house, take a wife and beget children." (Genesis Rabbah 9). This, of course, is not the final midrashic word on the subject. Genesis Rabbah earlier provided a halakhic midrash which seems to place Rabbi Samuel's speculation out of bounds: "'Ask now of the days that are past which were before thee, since the day God created man upon earth' (Deut. 4:2). Thus, the scope of inquiry is limited to the time since the Creation (of man)" (Gen. Rabba 1). Moreover, while Rabbi Samuel calls the the tendency to evil (yetzer harah) "very good," other rabbis claimed that it was among the four things which God regretted having having created (Suk. 52a, b) and identify it with Satan (B. B. 16a). Mekhilta. There are two versions of this midrashic collection. One is Mekhilta of Rabbi Ishmael, the other is Mekhilta of Rabbi Simeon bar Yochai. The former is still studied today, while the latter was used by many medieval Jewish authorities. The bar Yochai text was popularly circulated in manuscript form from the eleventh through sixteenth centuries, but it was lost for all practical purposes until it was rediscovered and printed in the nineteenth century, and thus fell into disuse. The text of Rabbi Ishmael is halakhic commentary on Exodus, concentrated on the legal sections, namely chapters 12-35. It derives various halakha from biblical verses. This midrashic collection was redacted into its final form around the third or fourth century, and its contents indicate that its sources are some of the oldest midrashim, dating back possibly to the time of Rabbi Akiva in the early second century. The Mekhilta of Simeon bar Yochai is based on the similar core material as Mekhilta of Rabbi Ishmael but eventually emerged as a distinct work. It covers Exodus 3-35 and is roughly dated to near the fourth century. Sifra on Leviticus. This work is traditionally believed to follow the tradition of Rabbi Akiva with additions from the school of Rabbi Ishmael. The core of this text developed in the mid-third century as a critique and commentary of the Mishnah, although subsequent additions and editing went on for some time afterward. Sifre on Numbers and Deuteronomy, going back mainly to the schools of the same two rabbis. This work is mainly a halakhic midrash, but includes a long aggadic part in sections 78-106. References to it in the Talmud, and in the later rabbinical literature indicate that the original core of Sifre was on the Book of Numbers, Exodus and Deuteronomy. However, transmission of the text was imperfect, and by the Middle Ages, only the commentary on Numbers and parts on Deuteronomy remained. The core material is thought to have been redacted around the middle of the third century. Sifre Zutta (The small Sifre). This work is a halakhic commentary on the book of Numbers. 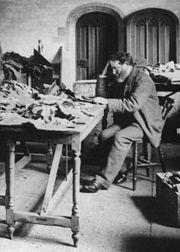 The text was only partially preserved in medieval works, while other portions were discovered by the modern Rabbi Solomon Schechter in his research in the famed Cairo Geniza. It seems to be older than most other midrash, coming from the early third century. Midrash Tadshe (called also Baraita de-Rabbi Pinehas ben Yair). This midrash is peculiar in several respects, varying in many statements from other midrashim and having a very loose structure. It has a strongly symbolic tendency, and it plays much on groups of numbers. It also shows a strong relationship to the Book of Jubilees. Widely studied are these great midrashic commentaries on the various different books of the Bible. The Midraish Rabbah is not a cohesive work, but a collection from different authors, in various locales, in different historical eras. Bereshith Rabba also called Genesis Rabbah. This text dates from the sixth century C.E. A midrash on Genesis, it offers explanations of words and sentences and aggadic interpretations and expositions, many of which are only loosely tied to the text. It is often interlaced with maxims and parables. Its redactor drew upon earlier rabbinic sources, including the Mishnah, Tosefta, and the halakhic midrashim. It was probably redacted sometime in the early fifth century. Eicha Rabba (seventh century). Also called Lamentations Rabbah it was probably redacted sometime in the fifth century. Pirqe Rabbi Eliezer (eighth century of later), a midrashic narrative of the more important events of the Pentateuch. Tanchuma or Yelammedenu on the whole Pentateuch (ninth century). This work's midrashim often consist of a halackic introduction, followed by several poems, and exposition of the biblical verses, and the messianic conclusion. The two most important Tanchuma collections are Midrash Tanhuma Ha Nidpas (sometimes referred to as Midrash Tanhuma Yelamdenu) and a later manuscript published by Solomon Buber usually known as Midrash Tanhuma Buber. Seder Olam Rabbah (or simply Seder Olam). Traditionally attributed to the tannaitic Rabbi Yose ben Halafta, but now thought to be much later, this work covers topics from the creation of the universe to the construction of the Second Temple in Jerusalem. Yalkut Shimoni. A collection of midrashim on the entire Hebrew Bible, containing both halakhic and aggadic commentaries. It was compiled by Shimon ha-Darshan in the thirteenth century CE and is collected from over 50 other midrashic works. Tanna Devei Eliyahu. This work stresses the reasons underlying the commandments, the importance of knowing Torah, prayer, and repentance, and the ethical and religious values that are learned through the Bible. It is not a compilation but a uniform work with a single author. Rashi's commentary. The eleventh century rabbinical sage Rashi]] wrote a comprehensive commentary on the [Pentateuch and most other biblical books. This huge midrashic work is still considered the essential companion for Jewish Bible study at any level: beginning, intermediate and advanced. The tradition of midrash is by no means limited to the above collections. For example, the Talmud contains many midrashic passages, not all of which are specifically halakhic. The vast literature of later rabbinical commentaries is replete with midrashim on every variety of biblical subject. Indeed, any rabbinical (or even non-rabbinical) exegesis of a biblical text may be said to be a midrash, and the term can even be applied to non-Jewish interpretations of a text from the Hebrew Bible. In Christian tradition, Saint Paul frequently engaged in midrashic argument in his letters by justifying his views with the words "as it is written," followed by a verse of Jewish scripture (Romans 9:13, Romans 11:26, 1 Corinthians 1:19, and so forth). Jesus engaged in a halakhic midrashic exercise in his famous Sermon on the Mount when he said, for example: "It has been said, 'Anyone who divorces his wife must give her a certificate of divorce.' But I tell you that anyone who divorces his wife, except for marital unfaithfulness, causes her to become an adulteress, and anyone who marries the divorced woman commits adultery." (Mt. 5:31-32) Later and contemporary Christian commentators on Old Testament texts may also be said to be engaging in a "Christian midrash." For example, the traditional Christian midrash on Isaiah 53 interprets the Suffering Servant as Jesus, while the Jewish midrash of the same chapter sees the servant as Israel. A wealth of literature and artwork has been created in the twentieth and twenty-first centuries by people aspiring to create "Contemporary Midrash." Forms include poetry, prose, bibliodrama (the acting out of Bible stories), murals, masks, and music. Bakhos, Carol. Current Trends in the Study of Midrash. Supplements to the Journal for the study of Judaism, v. 106. Leiden: Brill, 2006. ISBN 9789004138704. Hartman, Geoffrey H., and Sanford Budick. Midrash and Literature. New Haven, Conn: Yale University Press, 1986. ISBN 9780300034530. Kugel, James L. Studies in Ancient Midrash. Cambridge, Mass. : Harvard University Center for Jewish Studies, 2001. ISBN 9780674002586. Neusner, Jacob. What Is Midrash? Guides to biblical scholarship. Philadelphia: Fortress Press, 1987. ISBN 9780800604721. This page was last modified on 4 October 2018, at 15:20.